...tomorrow, 5 December, to the Netherlands. He marks my 6th-year anniversary since moving here! It is that time of year. He looks like he is having fun. Ginnie Hart: Definitely that time of the year, Michael. I don't think he knew what to do with himself. What a beautiful costume! Lovely montage - and Congratulations on your anniversary! Ginnie Hart: This is how the European Sinterklaas looks, Elizabeth...more like a Catholic bishop, imho. And Astrid would be the first to tell you he is NOT Santa Claus. It's been a very interesting tradition to get used to! Thanks for the congrats on our anniversary. We met in real life 8 years ago on November 30th, so this is an exciting time of the year for us. I have to say that he looks great..
Ginnie Hart: I love all of it, MLMA. It seems like it comes around faster and faster, though, every year! We must be doing something right. What a lovely collage! Happy Anniversary to you Ginnie! Ginnie Hart: Isn't that the truth, Chris. We must be doing something right! Oh yes, he has come again! A fine collage! Do you remember our meeting three years ago in Woudrichem? Ginnie Hart: He has definitely come again, Philine. And how could I ever forget your time with us in Woudrichem?! It was one of the most soulful days of my 6 years here because we had fog all day long! Cripes, Ginnie...ole Nich is dressed like a Bishop! Ginnie Hart: That's exactly what I say every year, Ray. And to think the American Santa Claus evolved from him! My congratulations on your anniversary! In our country St. Nikolaus will come on Sunday. Yes, he is a bishop, a holy man! Ginnie Hart: Thank you, Philine. And yes, I know that we're one day apart on our Sinterklaas celebration. I do wonder how that happened, though?! Ginnie Hart: He sure knows how to steal the show, Anne. Wow, how time flies Ginnie, good to see Sinta again. Ginnie Hart: Time really does fly, Chad, doesn't it! Guess that means we're really having fun!!! Happy anniversary to you Ginnie! Ginnie Hart: I know, JP. Just a few places get the honor. Ginnie Hart: St. Nicholas, indeed...the pre-cursor of America's Santa Claus. I remember so well when you moved and the excitement all around. Ginnie Hart: And what's so wonderful for US, Mary, is that we are both still excited. Ginnie Hart: I like the thought, Tom! It still does not seem like that it's just three weeks away. .i bet it does not seem like 6 years ago either since you moved across the pond. Happy anniversary; your "presence" is very welcome. Good of Sir Tiff to dress up. Ginnie Hart: HA! Sir Tiff made my day, Alan. So did you. Ginnie Hart: I will always celebrate in style, Janet. A lovely set of pictures - congratulations on your anniversary. Some years, when the kids were younger, we did Sinterklaas. Dutch influence in my household Today I became granddad for the 5th time. Little feller by the name of Logan. Ginnie Hart: Congratulations, Louis. I'm quite sure Logan will know all about Sinterklaas in due time! He certainly looks very smart in that outfit. Doesn't time fly when you having a great life, enjoy tomorrow Ginnie. Ginnie Hart: I love THIS outfit much better than the Santa Claus one I grew up with, Brian. Thank you. Ginnie Hart: Thank you and thank you, JP. Ginnie Hart: Oh, yes, Cherry, and he's just getting started. Ginnie Hart: SIX years, Peter. SIX years have gone by quickly! It's still hard to believe, so I pinch myself again and again. he is wearing a fish hat, like the pope lol that's kinda weird!!! hope he blesses you with your fave gift! Ginnie Hart: Yes. 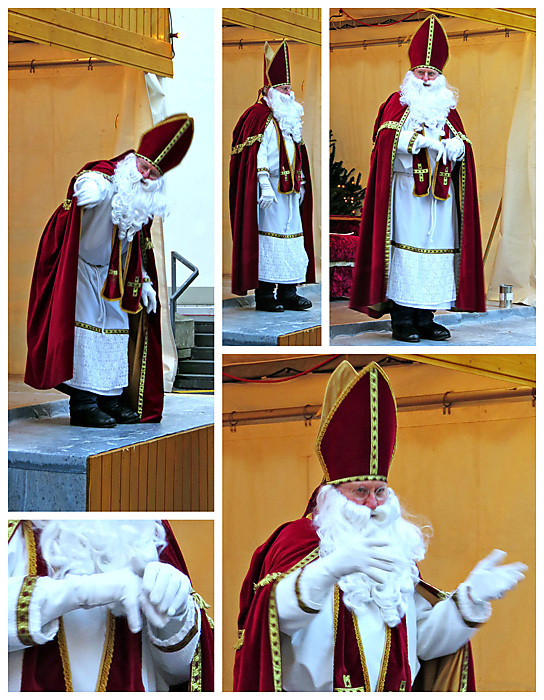 The European Sinterklaas always reminds me of a Catholic bishop! Ce personnage a un air bien sympathique. Ginnie Hart: Thank you, Martine. Leave it to Sinterklaas! Ginnie Hart: OH, YES! Zwarte Piet is NOT gone in the Netherlands yet, Robin!! !